A collection of brief, topical Bible studies for small groups or individuals. Each study includes a short lesson, Bible references and discussion questions.Whereas the typical Bible study book covers a single topic, 102 Fascinating Bible Studies gives small groups a wealth of options to choose from each week. Today's small groups need guides that allow for flexibility, whether because they are in a temporary transition, their membership is in constant flux, or they are taking a short break between longer studies. 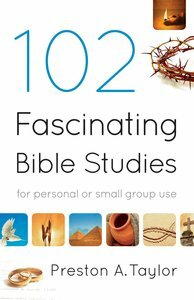 102 Fascinating Bible Studies contains a wealth of diverse topics, ranging from "angels" to "temptation" to "worship." This book is also ideal for individuals looking for a refreshing new devotional guide.Preston A. Taylor is a retired pastor and missionary to Argentina. He received his BD and ThM degrees from Southwestern Baptist Seminary and his DMin from Luther Rice Seminary. For the past 25 years, he has written a weekly devotional message for newspapers in the towns where he has served as pastor. Dr. Taylor currently lives in Zapata, Texas. About "102 Fascinating Bible Studies"
Preston A. Taylor, autor de mas de diez libros publicados, es graduado de la "Universidad de Ouachita", del "Southwestern Baptist Seminary" y del "Luther Rice Seminary" de Georgia. Tambien realizo estudios en el "Moody Bible Institute". Por nueve anos sirvio como misionero de la Junta Bautista Internacional en Argentina. En la actualidad es pastor de una iglesia bilingue en Texas.